Oakwood manager Mark Gilbert has recruited former Three Bridges Reserves manager Simon Boddie as new joint- manager to give them a push towards promotion. Boddie is leaving Ryman League neighbours East Grinstead along with his coach Nick Hahn who will work alongside existing coach Jimmy Ferrar. Oaks lie sixth in Sussex County League Division Two and have up to five games in hand. 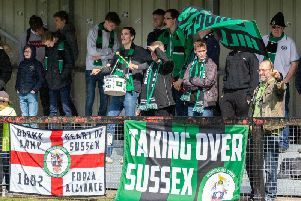 However, they will have to build a new 50-seater stand costing £20,000 by March 31 or they will be relegated according to Sussex County League rules. They have applied for a grant for funding. The club’s chairman Stuart Lovegrove will oversee the work.